surprised when I showed up at their deathbed vigil during my training. The wife of one elderly patient met me at the door and cupped my face with her hands. “You’re so young,” she said. “What are you doing here?” It was the question of my life. Music thanatologists care for dying patients using harp and vocal music as prescription rather than performance. With the raw materials of music, we offer vigils that are tailored to a patient’s diagnosis, vital signs and responses in the moment. Rather than providing a concert of familiar songs, a music vigil offers a quiet space for reflection, rest and, sometimes, for finding meaning as death approaches. ired by various medical organizations, we go wherever the patients are: hospitals, nursing homes, hospice inpatient units and private homes. Someone who is dying quickly may receive just one music vigil, while people who are declining slowly may receive many during their last weeks or months. I’ve done this work as a student in Montana, an intern in Oregon and a professional at a hospice in Illinois. For the last nine years I’ve worked part time at a hospital near Boston. Being called an angel is a compliment, usually. Angels signify protection and peace, and the word suggests that I have some special expertise about death. But we are all death people sooner or later. We will lose people we love and be stamped with our own dates, a beginning and an end. Soon my own body, whose 40-something changes now surprise me, will be gone. Even this essay will be archived into zeros and ones, a digital afterlife that will last longer than the hands that typed it. I was still in college when I read a magazine article about music thanatology and decided that it met my life goals at the time: to be a creative person and to save the world. 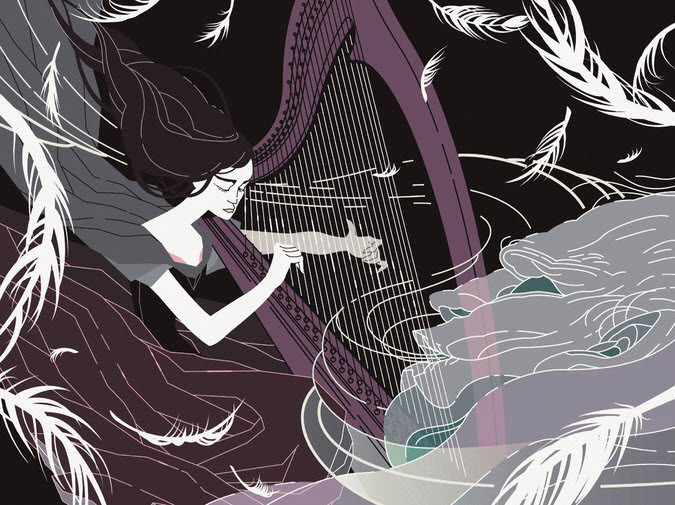 I played the piano and sang in an a cappella group, but I had never touched a harp. Most of my peers thought that working with the dying sounded crazy. This did not stop me from discussing my plans in overwrought, earnest tones. A few people standing nearby laughed. I realized later that in my prattling about harps and ritual processes, I had failed to understand that military service might provide a faster, and much less abstract, education in human suffering. The two-year training consisted of musical preparation in harp and voice, as well as classes in subjects such as anatomy and physiology, medical lectures, history and anthropology. It included an internship of supervised music vigils and a certification process. When I was admitted to the school, I discovered that the cheapest option for buying a harp was to build it myself. I ordered the kit. A few weeks later, a thin cardboard box about the size of a snowboard arrived in the mail. Over the course of a summer, I hammered together its contents into a five-foot tall Gothic harp. If you peek through the holes in the back of the soundboard, you can see my name and the date that I signed it, Aug. 22, 1996. For almost 20 years, I’ve talked about music thanatology with friends, family and strangers in elevators who ask about my harp. Often they share their anxiety about death. “It takes a special kind of person to do what you do,” they say. “I could never be around that kind of suffering all the time.” But they are wrong. I’m not around suffering all the time. I’m around love.